Looking for the Perfect Mile Race? Results are available via our Results Link to the left. An a most heart-felt THANK YOU to all our VETERANS! OUR SOLDIERS GIVE SO MUCH, CAN YOU GIVE A MILE? WE RUN TO HONOR THE BRAVE. 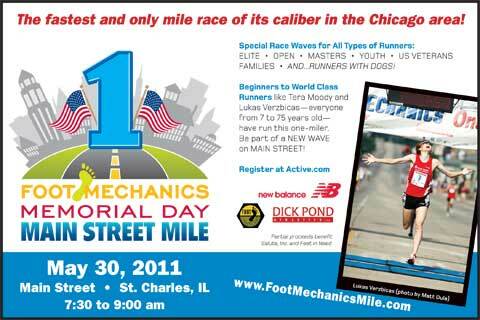 Come run the Foot Mechanics Memorial Day Mile on May 30 along historic Main Street in St. Charles, Ill.
It’s the fastest one-mile race of its caliber in Chicagoland. And it’s all downhill! The race features special waves for all types of runners—elite, masters, veterans, families, students—and even dogs! There’s a place for everyone, beginners and world-class athletes alike. So, just how fast, can YOU run a one-mile race? 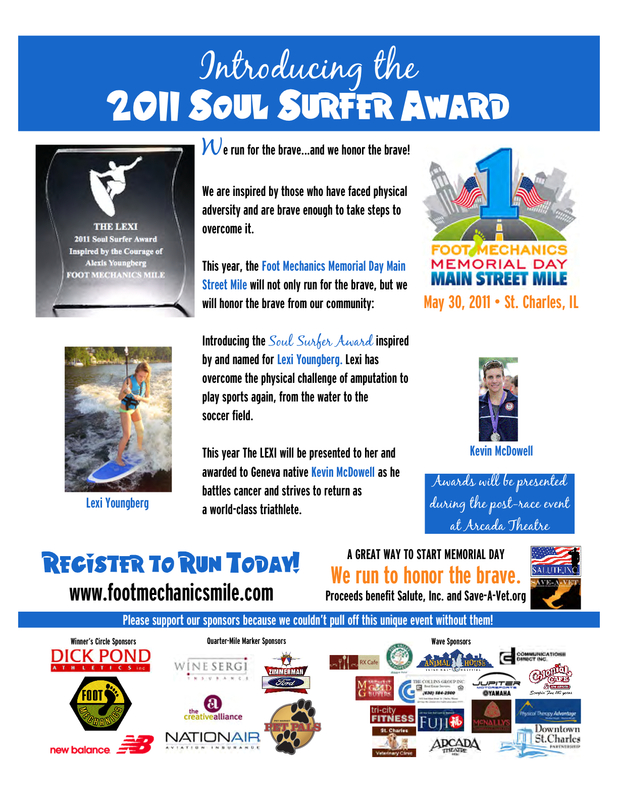 Memorial Day—May 30, 2011, first wave starting at 7:30 a.m.
Main Street, St. Charles, Ill.
LOTS of GOODIES and Prizes! Register now to receive your T-shirt or armwarmers! All dogs who enter receive flag bandanas! 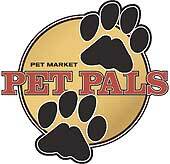 The medals for Pet Pals Top Dog winners are custom dog tags that can attach to dog collars.